If you’ve ever wondered how your favorite influencer always has a photographer ready to capture her latest outfit or vacation, the answer is simple: she’s got an Instagram husband. If you were to draw a Venn diagram, the circles of “Actual husband” and “Instagram husband” would overlap for many successful influencers. But a marriage license is hardly required to meet the definition. An Instagram husband is simply the person behind the camera, always ready to snap a photo (or 50) when the right moment arises. So who are these Instagram husbands, and how do you know if you need one? Read on to find out. It made perfect sense: romantic partners are usually around to capture those photogenic occasions. The rationale for the fashion bloggers was that they were more affordable than a professional photographer, and could take direction. Even more importantly, they understood their subjects better than anyone else. These qualities in a photographer became even more valuable with the rise of Instagram. Who better to document all those natural, spontaneous moments that perform well on the platform than your romantic partner? For as long as the phrase “Instagram husband” has been circulating, it’s been used as a punchline. No guy wants to be like the miserable men in the viral Instagram husband video, unable to even sip their latte without taking a photo first. That video was made by a real-life Instagram husband, Jeff Houghton, and features him and his wife. Houghton has said that he didn’t mean the video to be “a statement on gender roles,” but it’s not a flattering depiction. The idea that a man might enjoy taking his partner’s photos, or that he might care about her happiness and success, isn’t part of the skit. @jeffhoughton ~ Overwhelmed with thankfulness for your love and this life we’ve built together. Every year just gets better. Happy anniversary my love. This idea is changing, in part because Instagram husbands are becoming more visible. While blogger boyfriends generally maintained a low profile, Instagram husbands make frequent appearances on the platform. Influencers chronicle their lives on the platform. They share photos of their homes, pets, workout routines, and vacations. So of course they post about their significant others, too. Some Instagram husbands are even becoming influencers in their own right, like Robbie Tripp. He capitalized on his viral “curvy wife” Instagram post and launched his own public career. But plenty of Instagram husbands do way more than take photos. As Taylor Lorenz wrote in The Atlantic, many are full-fledged partners in the influencer business. With the help of their husbands, many influencers have built massive audiences, led successful campaigns, and even launched their own products. This growth is possible because Instagram has evolved. It’s no longer just a place to post pretty photos; it’s also a launch pad for brands and businesses. Likewise, many influencers started their account as a fun hobby but have grown it into a career. As the platform has changed, so too has the understanding of what an Instagram husband does—at least a little bit. So what does an Instagram husband really do behind the scenes? Ramirez, who interviews other Instagram husbands for his podcast, says there’s a lot of variation. While Instagram husbands are a modern convention, the marriage-and-creative-business partnership is nothing new. Famous literary couples like Vladimir Nabokov and his wife Vera, or Virginia Woolf and her husband Leonard, split their labor the same way. One partner focuses on creative efforts, and the other keeps everything running smoothly behind the scenes. In part, that challenge is due to harassment. Many influencers have spoken out about being harassed on the platform. As an influencer’s audience grows, so does her likelihood of attracting trolls. While a professional photographer could take amazing photos, a trusted partner is also there for support when dealing with critical comments or bullies. If you’re looking to grow your career as an influencer, an Instagram husband can be a huge asset. But don’t assume you need an actual spouse who’s good with a camera—or any spouse at all. Not all popular influencers have husbands who love picking up the camera. That’s why many of them work with dedicated professional photographers. For example, Arielle Charnas of Something Navy collaborates with photographer Alexandra Wolf. But if you don’t have that kind of budget, you can still rely on a network of support. Aimee Song, who has 5.2 million followers, asks her sister, boyfriend, assistant or even her dad to snap photos. To ensure she gets a good shot, she provides lots of direction to her impromptu photographers. Ramirez said that he’d heard of people working with their moms, but couldn’t think of any examples of Instagram wives taking photos for their husbands. This might reflect that influencer marketing is female-dominated. Women shared 83.9 percent of sponsored posts in 2017. But that doesn’t mean they don’t exist. In the vast universe of Instagram influencers, there must be a few women behind the camera. Mariano di Vaio, who has more than six million followers, is one male influencer. His wife is often in his photos, though it’s not clear whether she takes them. However, she definitely manages the influencer accounts of their children. There are also queer influencers with supportive partners like Angelis Borges, whose wife Nina makes frequent appearances in front of (and behind) the camera. Now that you know you don’t need to take the term “Instagram husband” literally, what should you be looking for? There are a few universal qualities that Instagram husbands have in common. If you’re scouting for a partner, here’s what you need. The most important word here is “Instagram,” not “husband.” You need to find someone who can take excellent photos, which are the key to building a strong presence. Fortunately, anyone can learn to take amazing photos for Instagram. With a little practice and patience (and some editing tools), you can get those high-quality snaps. A few tips: use natural light, try different angles, and take a ton of photos so you have options. A strong creative partnership is founded on trust. Think about it: you’re more honest and open with your close friends than with someone you don’t really know. Conveying that authenticity is valuable when developing your voice as an influencer. And having someone you can rely on allows you to plan for the future. “We’ve known a lot of people in this industry, and the ones that seem to continuously improve each year are those with a solid foundation set by a team and/or Instagram husband behind the scenes,” said Berolzheimer. You don’t want a relationship like the Instagram husband video, where the job is a huge drag for the men involved. Instead, you want to find someone who genuinely wants to help your influencer career grow. And a supportive partner will also lead to better content, because they’ll take pride in their work with you. “The BEST Instagram husbands I have met are the ones that give up their pride and ego and help in every area that they can with their spouse,” said Ramirez. Another important quality? Someone who doesn’t mind sharing in the attention. 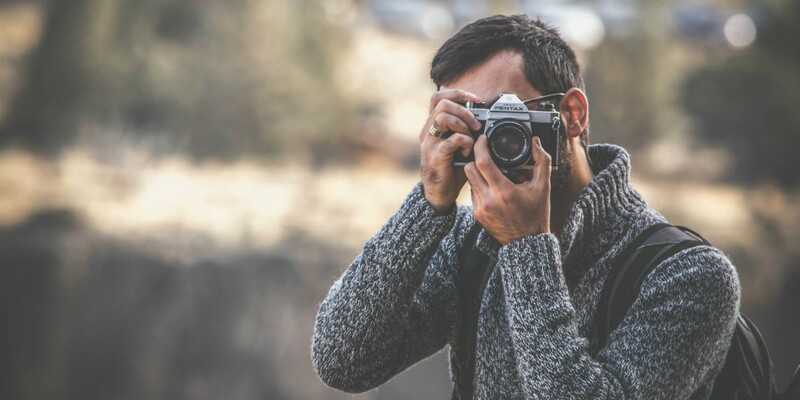 Your audience will want to see the person taking the photos. Your Instagram husband should expect to make an appearance on your account from time to time. An Instagram husband understands that being an influencer is a career. Even though influencers make their lifestyle look like fun, it’s still a job that requires hard work and strategy. Whoever that partner is, they should help you set and reach your professional goals. Anyone can help you take a single photo for your account, but an Instagram husband is in it for the long haul. Ultimately, the Instagram husband phenomenon proves that influencer marketing is a growing industry. And if you want to build your own influencer career, now you know what to look for in a business partner!